Made from 100% cotton and prewashed for a super-soft feel, these pajamas are made in the USA, and do not have any flame-retardant chemicals. Choose from sizes 18M to 5T. 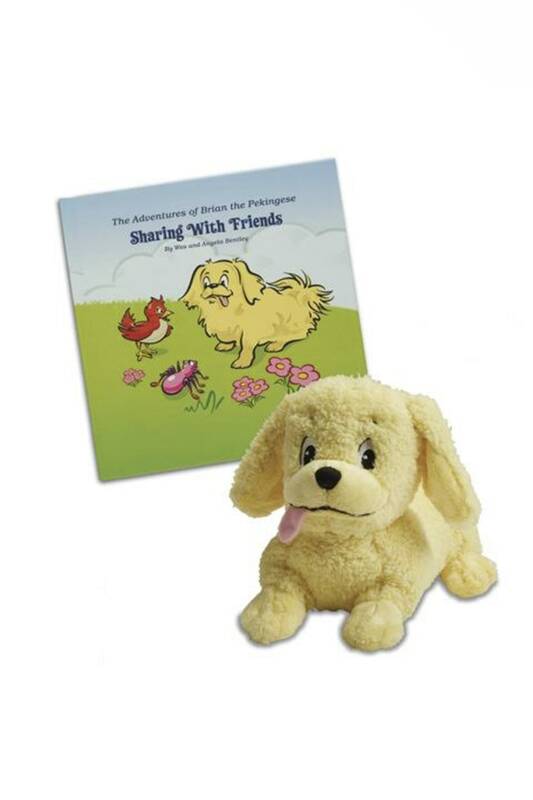 In this plush toy, book and short sleeve pajama gift set we make the pajamas from 100% cotton, and make them in the USA. We prewash the cotton for extra softness and to ensure no shrinkage, and we do not use any flame-retardant chemicals. And we pair the pajamas with a matching book, The Adventures of Brian the Pekingese Sharing With Friends. In this heartwarming story, Brian and his spider-friend Amanda are enjoying a warm sunny day in their backyard when suddenly an unknown bird arrives. Brian and Amanda learn to share with this newcomer to the neighborhood. Finally, we add the Brian the Pekingese plush toy. He’ll be your child’s best friend to cuddle with at bedtime. Made from all-fabric and with no plastic parts, this plush toy will surely inspire sweet dreams.